Recite the Holy Qur’an in Arabic with easy to understand English translation. This interesting Islamic app helps you not to miss your regular Quran recitation and earn blessings from Almighty Allah. This Quran Karim application has some decent features alongside captivating graphics. You can recite as per the ‘Surah’ as well as ‘Chapters’ as both options have been made available. This makes it easy for the reader to search the Surah/Chapter of his/her choice and restart reading where he/she left last time. 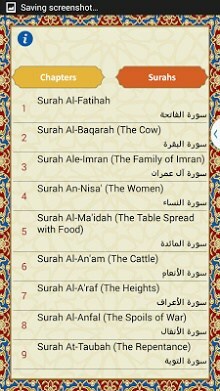 With the Koran (Quran) app, users can bookmark the chapter/surah/ayah of their choice and save them for the future references. Users enjoy a range of features like bookmarks and search. In addition, the Quran English translation has been made in a simple and easy to understand language. This is to ensure that you do not have to consult dictionary, while reading English translation of the Holy Quran. Finally, our Quran Karim app provides information about us (the developers), bookmarks details, and other Islamic apps developed/designed by Darussalam Publishers. Users can just tap on ‘other apps’ and land on the list of Islamic applications by Darussalam. Download a range of games and apps by D-Tech and enjoy a blessed experience.